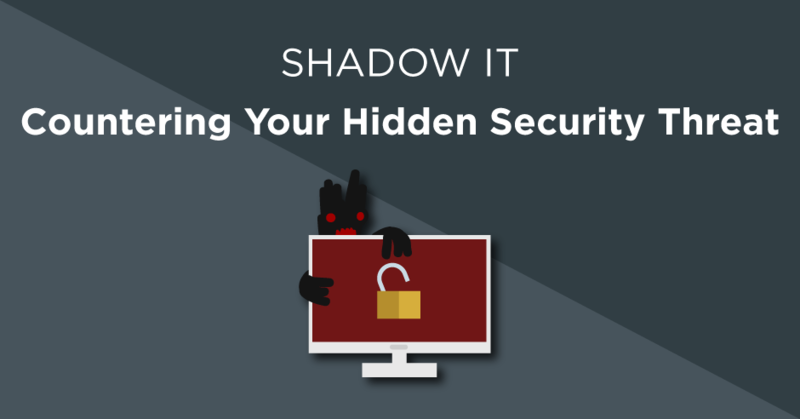 What is shadow IT and why does it pose a risk to your business? What is shadow IT and why must it controlled? Lurking deep beneath your surface IT infrastructure is a malignant force. Its creeping tendrils extend into every department of the business and like a rot it spreads. Whilst it started out innocent, as it grew more prevalent it’s evil nature emerged. Twisting roots buried deeper into the IT environment, corrupting business processes. Tendrils probed out, undermining defences whilst creating unseen vulnerabilities. And a maw guzzled and swallowed all the data it was fed. But the worst part of all about this malevolent infestation is this. It wasn’t an attacker who planted this thing in your network, no. It was you. Okay, while that description may seem a little dramatic, it’s undeniable that shadow IT poses a risk to your business. Gartner predicted that 1 in 3 security breaches will be the result of shadow IT applications by 2020. And Research from Cisco indicated CIOs underestimate the amount of shadow application running on the network by a factor of 14. That is to say, the CIO thought the business was running 51 cloud services when in reality it was using 730! These stats highlight how many businesses still don’t have a grasp on the extent of their shadow IT. The risks and controls have been around for years, yet many businesses wait until they get burned to take action. Shadow IT is when staff use IT applications (often cloud-based) which the IT team have not approved for use. Staff sharing files between themselves, suppliers and customers. Often with a cloud file store such as OneDrive, Dropbox or Google Drive. A member of the sales team using an online CRM solution to work on a campaign. An account manager using a personal Skype account to conference with clients. An employee using an online tool from their previous job, instead of the software their current employer uses. In each example, it’s obvious that these systems will be outside of the control of the IT department. This is a concern because it increases the business’ attack surface and adds many fun and exciting ways in which corporate data could leak. Shadow IT plays on the idea of “if you can’t see it, you can’t control it”. As a result, it creates a lot of invisible risks and security gaps which the IT team is unable to address. Of course, shadow IT may be bringing in benefits to a business. If an employee is more comfortable with their tools, they’ll work more effectively. But allowing it to run wild introduces gaping security holes and puts you at higher risk. Why does shadow IT occur? Shadow IT arose with the boom in cloud-based technologies and applications. This application explosion allowed employees to gain access to IT solutions through a web interface. And with so much variety, employees could buy an entire suite of tools with little no involvement from the IT department. The popularity of having sudden access to a plethora of applications was compounded by the fact that in the past, IT projects would have to stop or grind their way through the IT department before actually being usable. Whilst this wasn’t done with malice, the delay it caused frustrated power users who wanted rapid solutions to their issues. In short, the demand for change was louder and faster than the IT team’s resources, and even their awareness. Technology had come to the masses and they wanted to use that technology. Now. But blaming everything on the IT department isn’t fair and nor is it accurate. Another fundamental cause of shadow IT is misalignment within the business. Something which involves many departments and generally the board. A lack of control on the IT estate tends to make identifying a single reason for shadow IT impossible. This means the cause for shadow IT can vary from business to business. How can I manage shadow IT? Whilst the idea of prohibiting the use of any applications outside of an acceptable list seems like it would work fantastically, it doesn’t. Not only will it annoy employees and disrupt their workflows, but people will likely find a way around the filtering or will pester the IT team to add certain applications to the whitelist. Circumventing the point of the system in the first place and only resulting in a net negative. Instead, the business needs to address the root cause of its shadow IT by installing policy controls and technical controls to reign it in. Here are 7 simple steps to give you an idea of where to start. The first step is to use your internal monitoring and control solutions to analyse who is going where and doing what. It’s also worth auditing laptops and desktops if you allow users to install applications on their own devices (not advisable!). Go through your reports and work out which shadow IT elements pose the greatest risk. Staff sharing sensitive information or accessing the dark web through .tor browsers should both be big red flags. Whilst doing this, you may also find out you are breaking regulatory obligations without evening knowing it. For instance, by storing files in regions that are unacceptable. Shut down anything that is dangerous or breaking regulation immediately. If it’s illegal or breaks company policy then block it and take appropriate action at a management or HR level. Once you’ve dealt with the immediate dangers and know what’s going on give everyone the chance to stop using the unapproved shadow IT applications. Give them a week or two to alert you why certain applications are necessary and you can then manage the exceptions. After the week is up shut everything unapproved down. As you work through this process, take care to manage the external perception of the board and IT. People often use shadow IT to better fulfil their roles. So you should be trying to understand why they are using it and how you can fulfil their needs. You may even find that some shadow applications are of benefit elsewhere in the business and adopting them could be a net positive. You don’t want to turn the business against the IT team as everyone then suffers. It’s unlikely that regular employees are aware of the danger of shadow IT and why they shouldn’t use it. Clear policies with training and regular reminders should help minimise risks. You should always be monitoring and evaluating what’s going on in your network. People forget what they’re told, and the odd employee does go rogue. The technologies are out there and are nothing new. So there’s no excuse for not monitoring and blocking employees from doing things that could harm your business.